That looks and fits so well! Amazing work! That's it! You've done it! 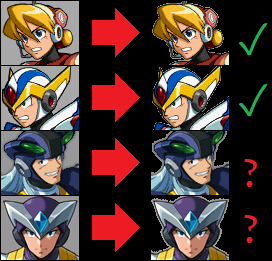 Actually, looking at it compared directly with X makes me realize that I should try and add another layer of shading to his ear. I'll experiment with that, and if it looks good I'll send it your way. It's so awesome that you're doing this. That looks great! If you're gonna stick with the magenta hunter, you should probably change the color of the text of the Hunter nametag in the text box (again, for some reason it's green but it's also plural). But damn, you actually pulled this off! Does he talk too? You did a great job, either way. Sorry if it seems a bit rude to edit Metalwario's sprites without permission (really I just wanted to see what this would look like, so this is more of a concept thing than an actual contribution), but I decided to fuse Metalwario's X mugshot and with the anatomy from my X mugshot to see how it would look like. I think it looks good. Again, sorry if I edited them without permission, I was just curious about this. I feel like it would be just a bit more complicated to implement this, due to the other eye being added in (which would probably require messing around with the animation data for X), so this was more of an idea I had. I think it would be good something to put in English and apply all these improvements in the PC version. Nice job for the hunter part. I think a better idea would be to add a tiny block under that huge pit in Gate's Lab 2 part 2 so that you can still do it with Unarmored or Shadow X without needing a specific, unintuitive part loadout. That way it's still hard to traverse, but not "officially impossible without reading a FAQ"
acediez said he's going to add it as an option for the patcher. That's a good step in the right direction. Still, I'd think it would be a good idea to split both stages either way (although that depends on the effort required to make it work properly). It was either that or make it a surprise feature on release. I'm not gonna split the stage, guys. I don't like the idea of deflating tension on the final stages (specially on a game with infinite continues). I'd do it as a request if it was a simpler thing to implement, but it doesn't look like it would be. And since we're back to discussing -that- pit, as DarkSamus933 says, it'll be available as an option on the next release. My approach to this so far has been to give every armor equal chance of going through the stage instead of removing the challenge, hence I made the air dash available for all armors. Now you'll be able to choose either solution, or both! And before anyone says "but the stage design is still bad": Yes, I know, but the (current) scope of this project is merely polishing what's already there. Modifying/expanding stages is a separate project entirely, as much of a game design project as a hacking one. What I mean is, if you're gonna go that far (all the documentation and custom tools needed to edit stages realiably), you might as well go all out and change more than just a few platforms here and there. You're making a new Mega Man X6 at that point. I'm not saying "never" though, but it's definitely a "not anytime soon". My approach to this so far has been to give every armor equal chance of going through the stage instead of removing the challenge, hence I made the air dash available for all armors. Now you'll be able to choose either solution, or both. And before anyone says "but the stage design is still bad" one more time: Yes, I know, but the (current) scope of this project is merely polishing what's already there. Modifying/expanding stages is a separate project entirely, as much of a game design project as a hacking one. What I mean is, if you're gonna go that far (all the documentation and custom tools needed to edit stages realiably), you might as well go all out and change more than just a few platforms here and there. You're making a new Mega Man X6 at that point. Valid point, and I understand why. Again, issues were with how both stages were poorly designed, and -a point I want to bring up- still respawning at the checkpoint even after a game over isn't necessarily good because you can't farm for more energy for your tanks (maybe an X4-esque checkpoint system would work? eh, forget it, I feel like I'm over complicating everything). But like you said, that's not what your project's about, so this is a fine alternative. Sorry if I sounded a bit needy. Cool! I'm drooling for the inside scoop on how that was done. If I could wrap my brain around it, I'd love to remove 3/4 of the spikes from the game. I'd take more bland over insta-death around every corner. Anyway, I think that'll be a default for me. 100x easier, but again, better than garbage design. I also have to ask about the other most egregious area, Gate 1's very first area. https://youtu.be/6S71Vjj34O4?t=2294 (38:14) While I'm on the fence about the weapon complaint, it's true but I think it's really stupid you can jump to the Gate stages to begin with, same with X5, if you're not playing at least 85% of the game, why even bother, but that's tangential, so I digress. Still really crap design. 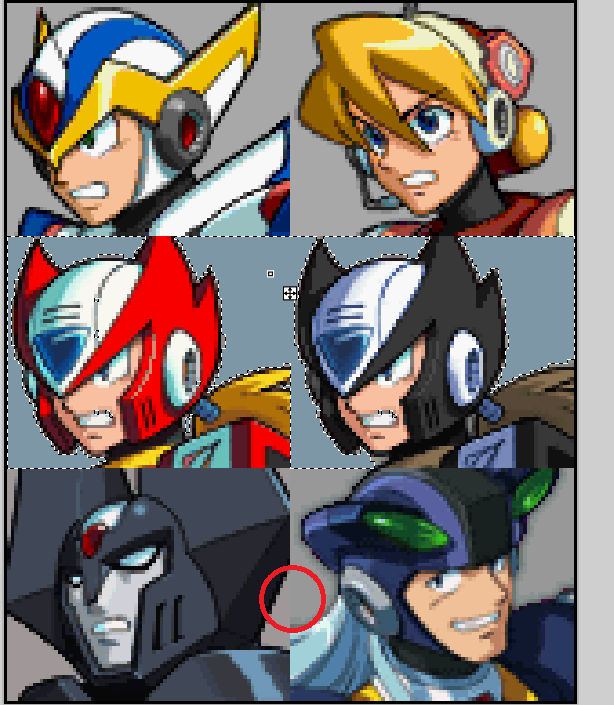 I actually noticed a while back that some mugshots are inconsistent: some of them have this weird, jpeg compression to them, making them look not as crisp as they should be (specifically, Gate, Dynamo, and every investigator except Yammark). Either that or my rips are trash. The mugshots seem to have this very "dither-y" look to them, and a lot of pixels that supposedly look the same aren't. Again: maybe trash rips, and quite a nitpick, but it's something I noticed. I really like contributing to this thread, it's fun, so if this seemed kind of irrelevant or wrong, then my mistake. The only real problem there to me is Dynamo's portrait. They clearly just nabbed his X5 cutscene mugshot and removed the background and animated it. Whoever did so didn't do a good job "anti aliasing" Dynamo against the grey background, and so it just looks like a blurry outline. I noticed this a while back, and I would like to correct this if acediez wants to provide me a ripped sheet of his mugshots at some point. Gate's isn't much of a problem, because it looks fine on its own. The only issue is some brighter pixels around his edges, which seem to indicate halos from them directly down-scaling a piece of artwork of Gate (seen in the Complete Works book) and just animating it from there. But it looks good enough to my eyes, as it's hardly noticeable, unlike Dynamo's blurry, botched attempt at anti aliasing.